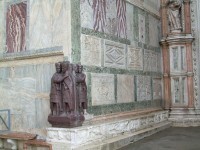 Framing a corner of the facade of St. Mark’s Basilica in Venice are high relief sculptures of four Roman emperors known as the Portrait of the Four Tetrarchs. Each pair is on a separate panel carved out of Imperial Porphyry, a dark purple-red color reserved in antiquity for emperors, in the early 4th century A.D. 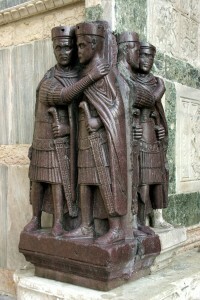 The figures are the two senior emperors (Augusti) and two junior emperors (Caesares) of the tetrarchy, a power-sharing system instituted by Emperor Diocletian in 293 that established one senior-junior pair to rule over the eastern empire (Oriens) and another over the western empire (Occidens). It only lasted two decades. By 313 civil war had chipped away at various usurpers and claimants leaving only Constantine I as Augustus Occidens and Licinius I as Augustus Oriens. It’s not possible to identify the specific rulers depicted in the sculpture. Unlike the portraiture of earlier Roman emperors, the Tetrarchs are not realistic. There are no identifying characteristics or attributes, no naturalism, no individuality in the carving of garments or the men wearing them. Each pair shares an embrace, one bearded figure and one clean-shaved. It’s probable the bearded figures are Augusti and the Caesares are smooth-cheeked, but that’s symbolic of their relative ages and ranks, not a reflection of tonsorial reality. It’s also possible they were carved after the functional demise of the tetrarchy and are actually the three sons of Constantine (Constantine II, Constantius II, Constans) and his nephew Dalmatius, all of whom held the rank of Caesar. What’s certain is they didn’t originate in Venice. They were looted, carried back to the city after the 1204 Sack of Constantinople during the Fourth Crusade. Their exact provenance has long been debated. No contemporary chronicles mention the Tetrarchs explicitly. There are references in 14th century sources to marble and porphyry tablets plundered from Constantinople, but not to sculptures. There are also references to stonework being looted from Acre after Venice defeated Genoese forces there in 1258. Some historians have posited that the 1258 date is accurate, but that it refers to the arrival of the Tetrarchs in Venice rather than plunder from the Genoese castle in Acre. 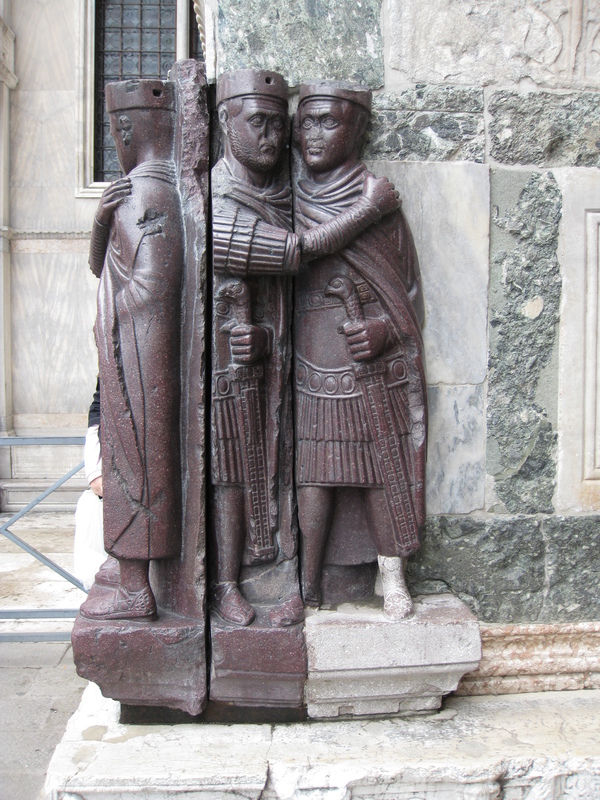 By this theory, the Tetrarchs had remained in Constantinople during the short-lived Latin Empire when Crusaders ruled Byzantium between 1204 and the restoration of the Byzantine Empire under Michael VIII Palaiologos in 1261. When the situation started getting hairy for the Latin Empire, the Tetrarchs and other loot were sent to Venice and arrived contemporaneously around the time of the Genoese loss at Acre. A popular legend dispenses with all this Crusader jazz. According to this version of events, the sculpture was once four thieves who were caught in the act trying to steal of the basilica’s treasure by Saint Mark himself. They were petrified for their crime affixed to the wall where the treasure is kept to guard it for eternity. 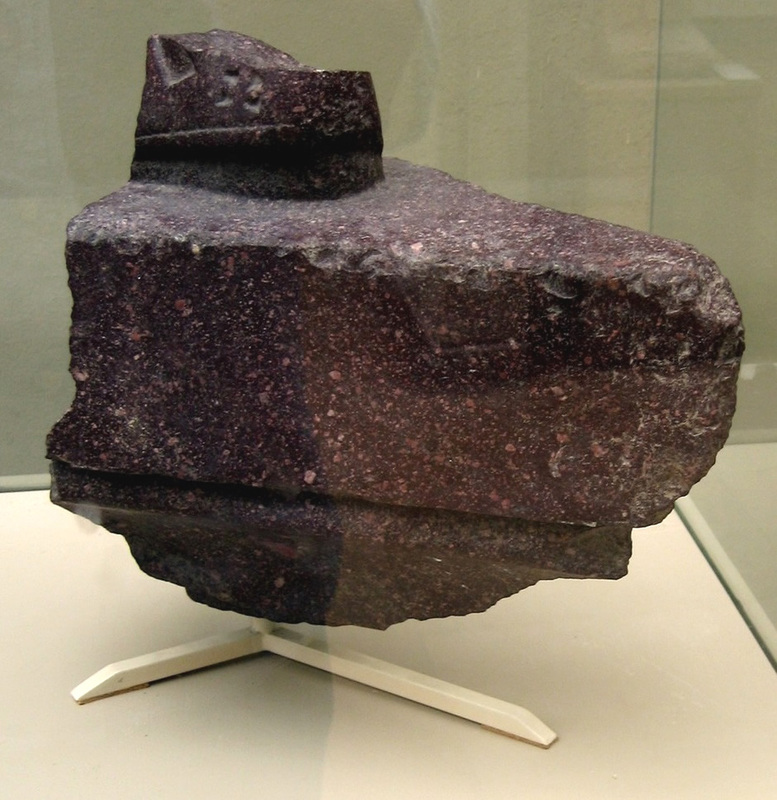 In 1965, a Turkish-German archaeological excavation underneath the Bodrum Mosque, originally a 10th c. church called the Myrelaion, in Istanbul recovered a porphyry fragment of a heel standing on a rectangular base. It seemed to fit the Tetrarchs whose fourth figure is missing his original feet and base. The Myrelaion was built over a 5th century rotunda and next to the Capitolium, a temple associated with the imperial cult built during Constantine’s reign. The Capitolium was also known as the Philadelphion, the “temple of brotherly love,” after the sons of Constantine. So the evidence has piled up, enough that for decades the Tetrarchs were widely assumed to have been plundered from Constantinople, but it has taken until now for an official confirmation. Last year, the Procurator of St. Mark made an exact replica of all four Tetrarchs in Venice and the foot found in Istanbul. The fragments were combined in one piece, which fits perfectly together. Additional analyses were also made of the materials and the porphyry used for the making of the sculptures and the foot fragment. The results have confirmed that indeed the same material was used for both and therefore they are identical.